Purdue Space Day is now fully mobile! Following two decades of successful growth, we are reaching out to the community via smaller, single-session events with local teachers and schools. 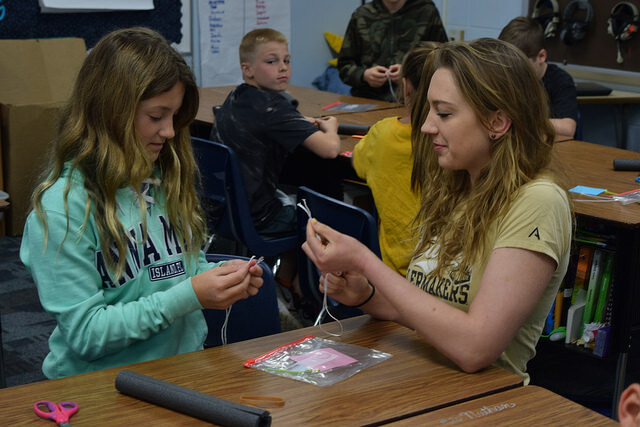 We visit third- through eighth-grade classrooms throughout the year, bringing our fun and educational STEM activities to schoolchildren in the Greater Lafayette area and beyond! For over two decades, Purdue Space Day has provided the opportunity for local children to learn about STEM in a memorable, interactive, hands-on way at our flagship fall event and in occasional outreach activities to local schools throughout the year. In recent years, the Purdue Space Day Executive Board has been expanding its outreach program to allow more children the opportunity to be exposed to space-related STEM education throughout the year. Space Day volunteers have worked with thousands of students in classrooms across the Greater Lafayette area, spreading their enthusiasm for STEM fields through a unique blend of educational material and fun, space-themed activities. Our mission is to continue to expand our local presence, inspiring the next generation of students to reach for the stars. Are you a Purdue student or staffmember interested in volunteering at one of our outreach events? Great! We'd love to have you become a Space Day Ambassador. Ambassadors have the opportunity to lead and support outreach events throughout the year, according to their schedules and availability. Events usually run about an hour and take place either on-campus or within a short drive. Interested in learning more? Email psd@purdue.edu or join our mailing list here. Are you an educator in the Greater Lafayette area interested in bringing a high-quality, interactive STEM activity to your 3-8 grade classroom? Contact us! We would love to discuss the possibilities and set up a time to come in and work with your students. All of our activities are fully self-contained - we provide the materials and the volunteers; you provide the curious students! We do our best to accomodate these requests, but please note that our ability to do so is limited by the availability of materials and our student volunteers. If we can't do it right now, we'll try to make it happen at a later time.